Welcome back to the Bev Turns Something Into Mini Pizzas Show. You know, if I’m going to have my own show, I should really do it right. Balloons, a podium, red benches, a scary clown. This sounds like the worst show ever. Oh my Lord it’s the BOZO SHOW. You know, I was on the Bozo Show when I was a kid. I totally was! In the early ’80s. And it was absolutely terrifying. Those bright lights, the audience, his hair I mean WHAT. is. that. I remember getting a loaf of bread or something. And my picture with him. I’ll try to find it so I can show you! Back to my show. I’m thinking more along the lines of a cozy crisp white set with vintage tones here and there. 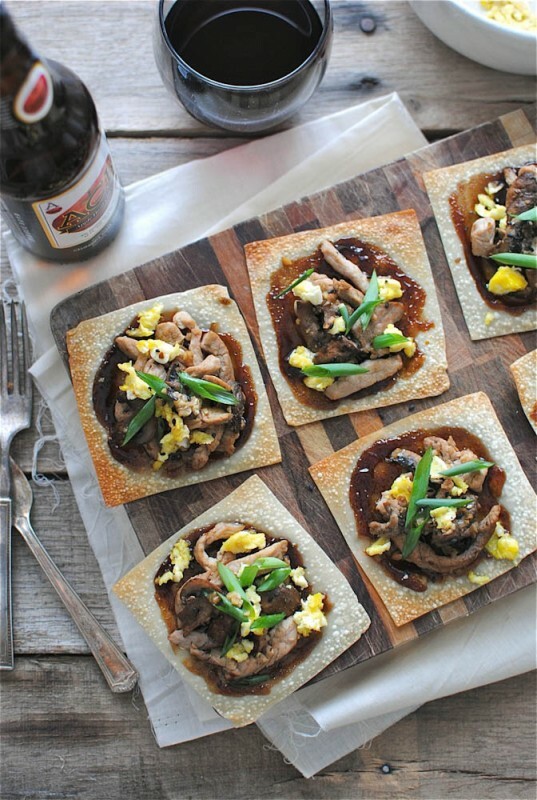 I ask you a question, and if you get it right, I give you a mini moo shu pork pizza. And a glass of wine. Ya dig? And the questions are like, “You still use Aqua Net, don’t you?” And then you say, “Oooooh ya got me! I do still use Aqua Net!” And then we look at the camera and laugh so jovially with our hands on our clavicles, and I look at the audience and say through tearful giggles, “Would you believe that! She still uses Aqua Net, and SO DO IIIIII hahah ah ah ah ahah!” And the audience goes berserk in laughter. And then we cut to a commercial and I throw my mic down and demand a raise. What a horrible, horrible show I have. How ’bout we just sit around and eat mini moo shu pork pizzas and you slap me upside the head because I keep saying mmmeeeeeewwwww shhhheeeeewwwww in your ear. Or how ’bout I just let you make these far, far away from me. Heat 1 Tbs. sesame oil in a wok over medium heat. Add the eggs and slowly scramble for the next 3 minutes or so. Season with a pinch of salt and pepper, and transfer them to a bowl. Cover to keep warm. Wipe out the skillet, and add the remaining oil. Raise the heat to medium-high and add the pork. (You’ll want to do this in batches, for good browning.) Season each batch with a pinch of salt and pepper. Transfer the pork to another bowl and cover to keep warm. Add the mushrooms to the pan (and a little more oil if needed) and sauté until browned and softened, about 3 minutes. Add the garlic and sauté one more minute. And a pinch of salt! Add this mixture to the pork bowl. Then start a band called The Pork Bowls. Flip your oven to broil. Lightly coat a large baking sheet with cooking spray. Arrange the wontons in a single layer, and lightly coat the tops with spray. Stick the sheet on the BOTTOM RACK (sorry to scream) under the broiler for 2 minutes. Stick back on the bottom rack for 1 to 2 minutes, or until the wontons are browned and crispy on the edges. Garnish with scallions and black sesame seeds. Seeeeeeeeerve her up! Who wants to be on my show?! 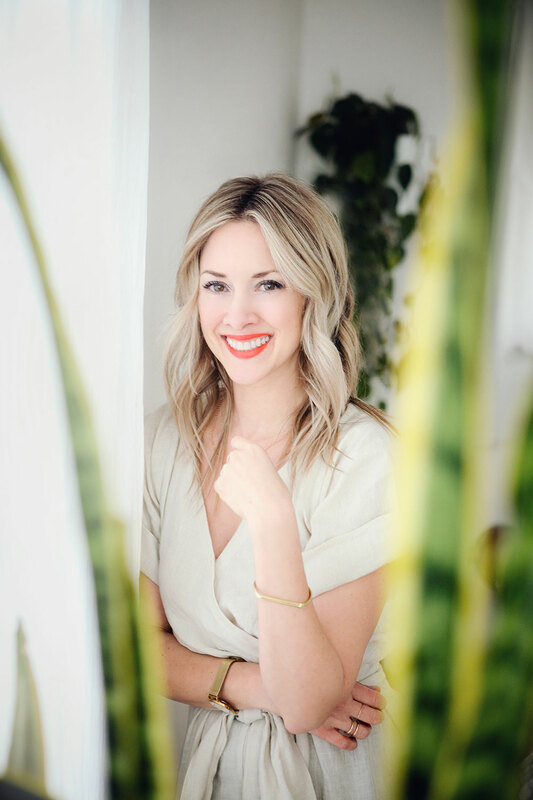 Awesome Giveaway with Anthropologie Stuff in It. And a Le Creuset. And Butter. I used to watch the Bozo show every day. I remember thinking how cool it would be to be on the show. I guess that is not the case! Did you get to play the Grand Prize Game? I'm going to need to see pictures of this Bozo appearance. That sounds awesome...and horrifying...and confusing?? Also, The Mask. Obvs. The Bev Turns Something Into Mini Pizzas show is my favourite show of all time. Nice! I was on Bozo in the mid 70s when we lived in the Chicago burbs. I remember the experience to be much like yours. Hope you get your show some day! I would so be on your show, but I expect these in the green room! These are the cutest pizzas OF MY LIFE! These would be so great at a party! I also love new things to use wonton wrappers in! I love your mini pizzas. The won ton wrappers are genius. Bev - These look great! Will have to try them soon:). 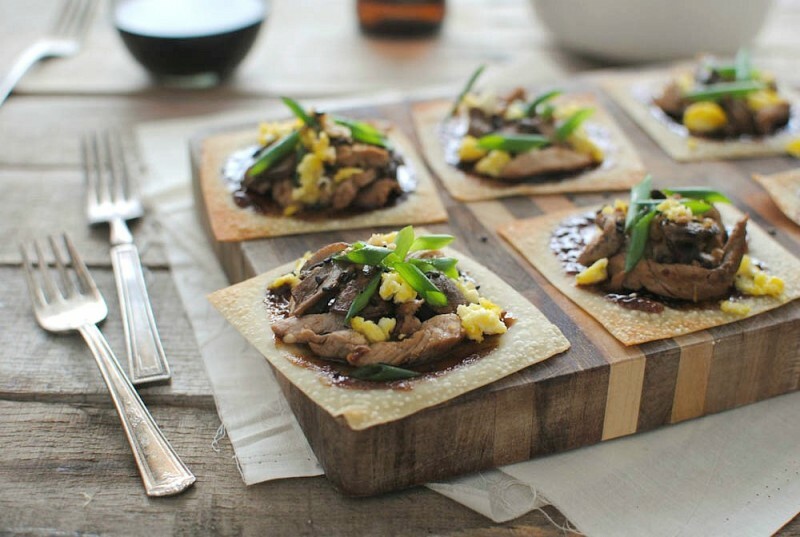 What a nice appetizer take on moo shu pork! I want 15 of these pizzas in my mouth right now. 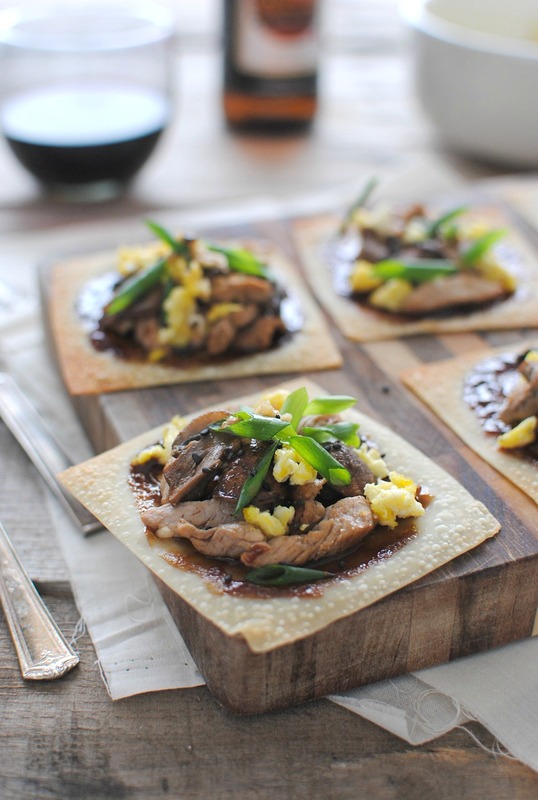 Moo Shu Pork is probably my very favorite Chinese dish- these are incredible, and i never knew you could do that with wonton wrappers. You are as genius as ever Bev. You can sing all you want, as long as these pizzas are involved! I love these pizzas. Keep the Bev Show going, I can't get enough! Oh to be a bug in your brain lol I imagine it's a hilarious time. ;) And wow... I haven't thought about bozo since the early 80s lol. I use AquaNet . . . To freeze bees, wasps, giant spiders . . . Then you can safely dispose of them . . . Try it! Where on earth is your cookbook? I have tried so many of your recipes from here and have never had one turn out less than amazing. 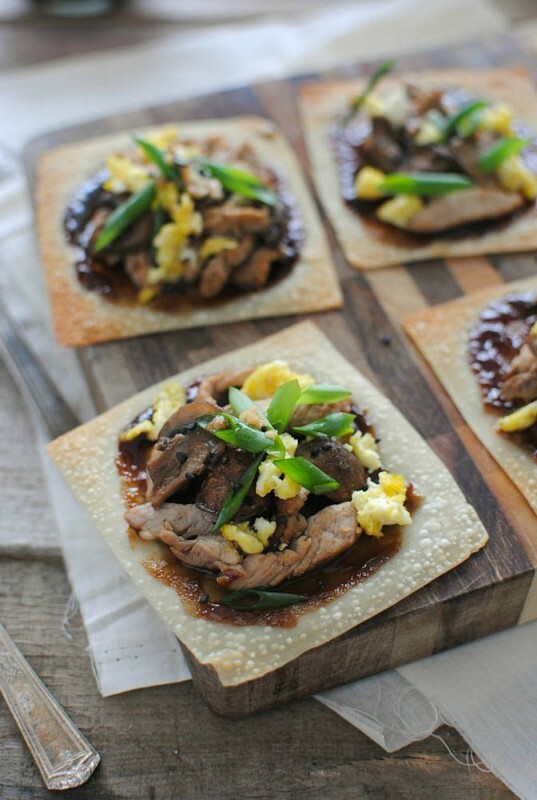 I love the idea of wonton wrappers as the base for these pizzas. So clever! I have a feeling I'm going to be putting all kinds of things on them. Can't wait to start experimenting! Oooh, I'll be a contestant if I can win one of these little pizzas! The wonton crusts are brilliant! in my mouth these should go. yes and yes.